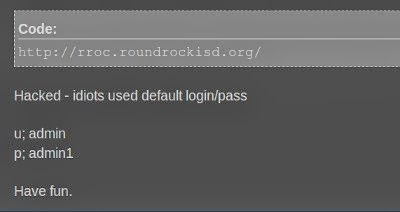 Round Rock Independent School District has shut down its website after hackers break into the website(roundrockisd.org). Hacker has managed to post vulgar pictures in the site. While i'm trying to get more information about the incident, i came across a Hackforums Post. In which, the attacker posted that the school website is using a default & very Weak Login credentials for the admin panel(username is 'admin' and password 'admin1). Round Rock Police detectives are investigating the incident. The district says it will press charges on the hacker who attacked their website, regardless of age. District spokeswoman, JoyLynn Occhiuzzi, said no student personal information was compromised in this security breach. Currently, the Home page of the website displays an error message: "All Round Rock ISD websites are currently unavailable. We apologize for this inconvenience."